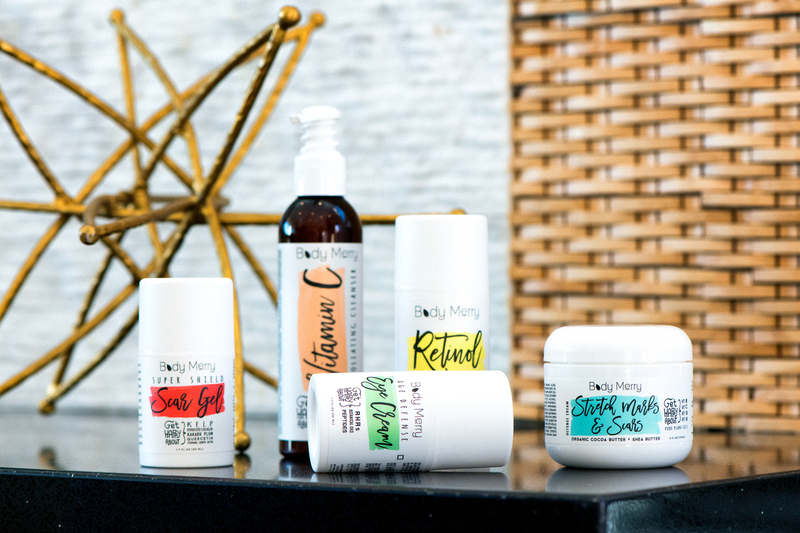 Just in time for the holidays, I recently discovered an amazing body & skin care line called Body Merry. As I get older, I’ve become more conscious about my body and skin’s overall health and appearance. Self care is important to me, so I’ll invest in products that I trust will make me comfortable in my own skin. It’s been a while since I’ve shared any beauty updates here, so today I’ll be showing you my Body Merry beauty haul! 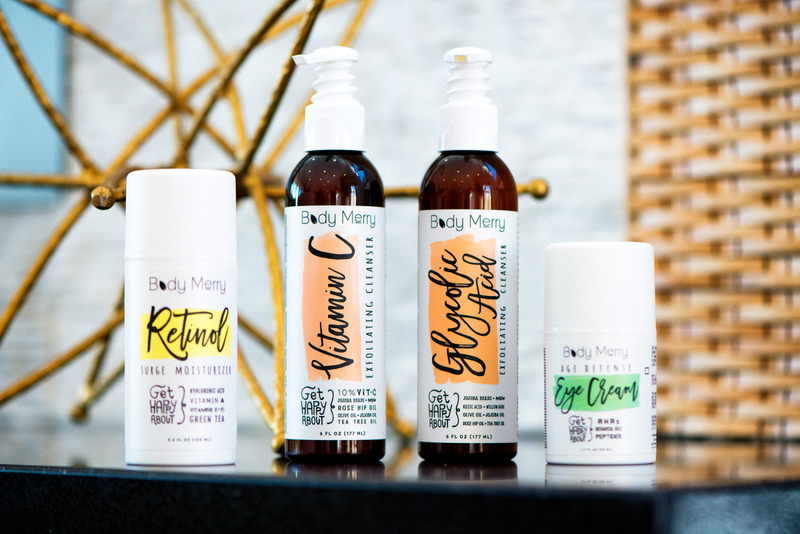 If you’re looking to change up your body & skin care routine, then read on to see what I think of these goodies from Body Merry. Some of these may make perfect gifts for your loved ones too! I’ve been in the market for a good eye cream for a long time. Not that I need to reverse damage already done (thankfully), but I am deathly afraid of aging. Besides, the under eye area is so sensitive — it deserves some extra TLC. I decided to give this eye cream a try since I saw that it was ideal for most skin types. So far, I use this age defense eye cream along with my moisturizer every night after I shower. The consistency is great as a neck cream as well. So, I also use this on my neck to avoid those unwanted neck lines. This eye cream is light, yet extremely hydrating. I will continue using it and hopefully it’ll keep those fine lines and wrinkles away! As someone who suffers from hormonal breakouts, I need a good skin care routine that will target those blemishes. I had tried so many spot creams aimed at diminishing pimples or flattening them out faster, but none yielded promising results. Some have helped to reduce the swelling and redness, but at the cost of very dry skin. This makes applying make-up a pain because my skin will be splotchy on the dry spots. I was so thrilled to find that Body Merry’s spot on blemish soother actually works without leaving me flakey! It’s great for all skin types requiring some extra love on breakouts and blackheads, and even the scars left behind. Come on, I can’t be the only one who likes to pick at pimples (lol!). The dark spots that result from the picking though, not so much. With winter coming up, I wanted to try a new moisturizer — one that not only does its job of moisturizing, but also help to keep acne away. Retinol is well-known for its anti-aging properties. This retinol surge moisturizer helps to fight wrinkles and discoloration, while keeping the skin healthy, hydrated, and smooth. While retinol has many great benefits, it’s not always the best for day time wear. Living in the desert where the sun rays are super harsh, I don’t use this moisturizer during the day just to be safe. I opt for a moisturizer with SPF in it instead. This one is a great night moisturizer though. If you didn’t already know, I’m a lizard mommy. It’s all fun and games until you get scratched — and I have plenty of scratches especially from my big Chinese water dragon, Babadook. He’s totally friendly but unfortunately when he walks over any part of my body, he literally leaves trail marks because his nails are so sharp like claws! With that said, I really wanted something to heal existing scars and restore my skin so that it’s nice and smooth again. Luckily, this stretch marks & scars defense cream has helped to gradually fade them over time. It’s reassuring to know that these scratches aren’t permanent on my body (as much as I love my lizards lol). In addition to fighting scars, this cream is also supposed to work well on stretch marks. For all my mom friends out there looking for a stretch mark cream to use either during or after pregnancy, this one may be worth trying! Stretch marks result from lack of skin elasticity. Since this cream is infused with a hint of cocoa butter, shea butter, and vitamins, it improves skin elasticity over time, visibly reducing the marks! The super shield scar gel is amazing if you have any scars that are raised or rough. I have a scab scar from years ago when I had a big cut and kept picking at it. After applying this gel consistently for a week, I’ve noticed the scar not only diminishing in size but also feeling a lot smoother. If you have any scars from surgery, this one may be worth a shot! I use this alongside the scars defense cream and have been happy with results so far. Regular acne fighters will know that glycolic acid is a must in a cleanser. I use this one when I’m most prone to breakouts, or am trying to fight them (usually on my period). It leaves my face feeling very clean and refreshed! By using this glycolic acid exfoliating cleanser with the retinol surge moisturizer and spot on blemish soother, I’ve been able to keep my breakouts at bay. Packed with powerful ingredients like kojic acid, plant oils, willow bark, and jojoba beads, this cleanser reveals youthful and radiant skin after just one use. Say goodbye to clogged pores, dead skin, and accumulated dirt and oil… and hello to a brighter complexion. In addition to a cleanser that’s targeted to fight acne, I wanted one that’s ideal for everyday use as well. This Vitamin C exfoliating cleanser is perfect for mornings when you just want a splash of a subtle citrus scent. Body Merry actually recommends that this cleanser be purchased with the glycolic acid one because this one is good for keeping up with your daily skin care routine. The glycolic acid cleanser is better for night use, whereas this Vitamin C one can be used both in the morning and night. Aaaand that’s my Body Merry haul for the season! Overall, I’m pleased with my new beauty routine. Body Merry’s products work really well with each other and the packaging is super cute, yet practical! What are some of your favorite body care products at the moment? Beautiful imagery – I want to try these products after reading this post!! Thanks Taylor! I would love to know what items you picked out and what you think of them if you decide to give Body Merry a try! Your skin and body is flawless — whatever you’re using I want to use too! I’ve never heard of Body Merry before but will definitely check it out. Seems like they have great products that would make amazing holiday gifts like you said! I need that eye cream in my life! I have pretty bad dark circles and can see some fine lines forming. You’re so right — it’s important to begin the anti-aging process early rather than late! Thanks for sharing your Body Merry haul and being so detailed about each product. It’s amazing!! I’m always worried about getting lines around my eyes so a good eye cream is a must. You had me at the vitamin c cleanser, I love that fresh and clean smell in the mornings 🙂 Plus, your skin looks amazing! Yes! Nothing better than a fresh start to the morning everyday 😉 Thanks babe! I’ve never heard of this brand but I love that they have a wide range of products! I also don’t know that many brands that target problem areas like stretch marks so that’s definitely interesting. Thanks for sharing love! Yes! I feel like they literally have something for everything haha. Since I get so many scars and scratches from my lizards, I need a good scar cream / gel! Such a great & informative post! (And yes, I’m a pimple popper too 😂😂) I want to try these all, thanks for sharing! You have gorgeous skin!! I’m always in the market for a good eye cream. Thanks for sharing! It’s amazing — definitely recommend it! You are so beautiful and this looks like a great product! Your skin is so clear and beautiful so I really need to start using these products! Lol! Ugh actually this week it was my pug who gave me horrendous scratches and not Babadook… but finally found some time today to take him to the groomer’s so I think I’ll be good from dog scratches for a while. Babadook’s love scratches is inevitable if I want to hold him 😉 haha I totally agree — the packaging for Body Merry is on point and cute enough to store out in the open in a bathroom year round! What a great collection of beauty items! I am currently expecting my third and could totally use that stretch mark cream. Ohh! I would love to hear your thoughts on the stretch mark cream and how it works on pregnancy stretch marks if you do try this! That looks really cool! I’ve never heard of it before! I’v never heard of this beauty line before, but the products sound amazing! I could definitely use that blemish soother, and I’m always looking for a good eye cream! The blemish soother is wonderful! I hate when my pimples get out-of-control huge, and this product does a good job of fighting that! Never heard of Body Merry. But I love their packaging! so cute and yet stylish!! The Vitamin C exfoliating cleaner sounds amazing. I will definitely give it a try. 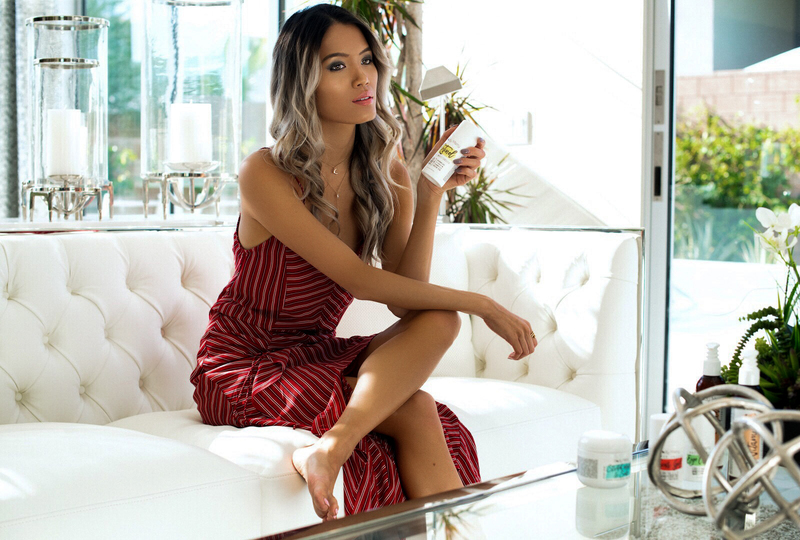 The Vitamin C cleanser is my favorite morning routine product lately! So refreshing! i love new skincare and i never heard of this brand so thanks for sharing! i’ll def have to try! Would love to hear your thoughts babe! The vitamin c exfoliating cleaner sounds great. Need to try it. Thanks for sharing! It’s a great everyday cleanser to have! Gentle and refreshing, yet does an impeccable job of leaving your skin feeling ultra smooth and clean. I think I’m going to have to give that stretch mark cream a try because I can already see all the stretch marks forming around my belly from the baby! I’m definitely like you and suffer from hormonal breakouts and so much more now that I’m preggers! Ahhh! One of the down sides of pregnancy I suppose. If you do give this stretch mark cream a try, I would love to hear your thoughts! Hormonal breakouts are the worstttt and I don’t know why I keep getting them! My mom told me that it’d get better once I hit my mid 20’s, and here I am… still suffering from it. 😐 At least there are good products out there to help mitigate the issue though. I’ve been pretty happy with the blemish soother from Body Merry! First of all your blog layout is amazing! Like wow the graphics and photos are vivid and fun. I love the branding and design of this product collection. You are so gorgeous and all of these look amazing! I’d be curious to try the stretch mark cream! Skin care is so important!! I always love trying new brands and products. For sure would ove to try this brand and see how results on my skin. really need the age defence aspa before I turn 30 LOL! Lovely photos babe! I haven’t heard of this brand before, but it sounds really great! I tried some of the Body Merry products out a few years ago and totally fell in love with their line. I love their packaging revamp and now I have a few new products to add to my wishlist, because if they’re all as good as the three products I tried previously, then I know I’ll love them! Ohhh! That gets me so excited to hear that you tried Body Merry products a few years ago and had a wonderful experience! I actually only recently discovered them haha. Their packaging is super cute and I love showing all my little bottles in my bathroom 🙂 Now is totally the perfect time to add to your wishlist with the holidays around the corner! These products sound amazing, need to add it to my list of things to try! Thanks for sharing babe! Would love to hear your thoughts on any product(s) you try from Body Merry! This sounds like it would work so well! Plus the scent is perfect for the holidays! Thanks Lindsey. Body Merry products (the ones I got at least) don’t really have any noticeable scent actually. The only ones that sorta do are the Vitamin C cleanser (most noticeable) and the stretch marks & scars cream has a faint cocoa butter scent. these products sound great! I need a new retinal moisturizer. I will check them out! Oh girl I know that feeling!!! I don’t know why I get random breakouts and when I do they are bad! But when I don’t have them luckily my skin looks really clear and smooth. Sigh haha. Hoping that the blemish soother will be the solution to all my acne problems. I haven’t used it for a full month yet so don’t know how my skin will react in the long run but keeping my fingers crossed!!! Body Merry beauty line looks incredible. I especially am interested the Spot on Blemish soother. The whole line looks wonderful. New products always make you feel and look better. It’s amazing! I wish that I discovered Body Merry in college because my acne was so bad back then. I tried so many products targeted to fight acne and nothing really worked (and left my skin really dry and flakey). This spot on blemish soother works well without drying my skin so I can easily apply make-up over the pimples as needed without looking patchy. Packaging is half the fun, right? Haha I couldn’t agree more babe! You skin is so flawless, and now I know why. hahah.. But seriously this line sounds great. I am definitely going to check them out. These products look amazing!! Love it a lot. Love that there is glycolic acid in that cleanser for more “sensitive” times of the month. 😉 Aside from hormonal shifts, how often do you use it? I find glycolic acid to be too drying for daily use. Curious what you have found with this products? Seems to have lots of moisturizing properties in there as well. And LOVE the price point:) I’m going to order some. My face is in need of a good chemical exfoliant!! I definitely use the Vitamin C one more often. Aside from hormonal shifts, I probably use the glycolic acid cleanser 3-4 times a week at night time. It hasn’t been drying for my skin unlike many other glycolic acid products which is why I love it! I feel like it’s pretty gentle on my skin, yet it works to keep my skin feeling healthy 🙂 You’re right, the price point is great for everyone! If you give any Body Merry products a try, I would love to hear your thoughts, especially on the products that weren’t part of my haul as I’m always looking to add new products to my routine! Love that style of your post 🙂 There are so many products mentioned that I’m keen to try. I usually just use make up remover and moisturiser for my everyday routine but I love experimenting! I wish I could have perfect skin with that simple of a routine girl! LOL! I need all the help I can get so I’m glad that Body Merry has a wide range of products for me to work with. This looks like a great skincare line! Retinol, Vitamin C, and Glycolic Acid are ingredients I always look for in skincare products. They are so good for anti-aging, brightening, and occasional breakouts. I’ll definitely be checking Body Merry out! Thanks for the code! Oh this looks like a perfect skin care kit, I need that stretch marks & scar defense cream and the vitamin-c cream. The eye cream is amazing!!! So light and yet so effective! Great post babe!! Now that I’m 8 months preggo, I’m really slathering on the stretch mark creams LOL I’ll have to check this one out 🙂 And love that it has natural ingredients!! Thanks for sharing !! First of all, you look so gooorge!! These products sound amazing & I love the packaging. I’ve been looking for a good scar removal product, I will definitely check this one out. I’ve never heard of this line, but I’m super intrigued! Their packaging is beyond cute. That scar healing product, looks too good not to try! I haven’t heard of these before. The scar product would be perfect for you!! I can imagine you would need it! I haven’t heard of this brand before, but I’m so interested in the Spot on Blemish smoother. I need a good product to use on those occasional breakouts! You look so gorgeous and these products sound amazing! I have heard a lot of good things about these products. Amazing review!